"The Obama Administration has presided over the most draconian crackdown on national security and intelligence whistleblowers in US history." Jesselyn Radack is the Yale graduate who defends those whistleblowers in court. She spoke out for Jeffrey Sterling at the National Press Club last week. Here is the video and transcript. 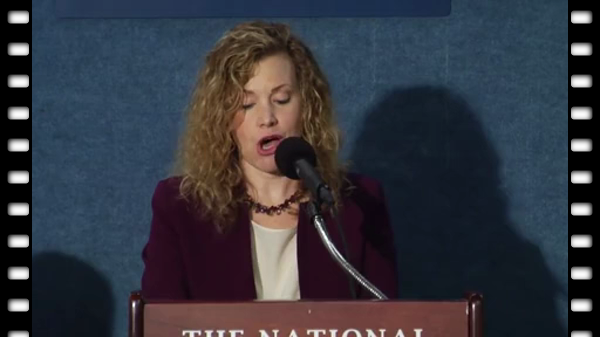 I'm Jesselyn Radack and I head the whistleblower and source protection program at Expose Facts (dot org).I do not represent Jeffrey Sterling, but I do represent half a dozen other whistleblowers investigated, charged and prosecuted under the Espionage Act. The Obama Administration has presided over the most draconian crackdown on national security and intelligence whistleblowers in US history. The Justice Department has used the antiquated Espionage Act as a bludgeon to threaten, coerce, silence and imprison whistleblowers for alleged mishandling of classified information. Meanwhile, powerful and politically connected individuals accused of the same or much worse conduct receive, at most, a slap on the wrist: like General David Petraeus who gave away more secret information classified at a higher level to his mistress and received a sweetheart plea deal for a minor misdemeanor, or Hillary Clinton - she got a prime time TV apologist political spin interview from President Obama himself, and she will likely be our next president. Sterling's conviction is a gross miscarriage of justice. The Espionage Act has become a strict liability law, meaning that the prosecution does not have to prove that the whistleblower had any intent to harm the United States or benefit a foreign nation. Worse, Sterling's conviction is based on flimsy circumstantial evidence that almost certainly would not result in a conviction except under the very vague and overbroad Espionage Act. Taking a step back from the criminal trial that brought us here today, and putting aside Jim Risen's book and anything written there about the botched CIA program that gave rise to the Iranian's nuclear intelligence, I would like to remind everyone that Jeffrey Sterling IS a whistleblower. Sterling is a whistleblower because in 2003 he met with staff from the Senate Select Committee on Intelligence: "a proper political internal channel" that we're always hearing people shout about, and he made reports about what he saw as a botched CIA operation. It's hard for me to see yet another person punished in this way. Sterling's case is very reminiscent for me of alot of my NSA clients, especially Tom Drake, who you will hear from in a few minutes. Tom Drake, Bill Binney, Kurt Wiebe, Ed Loomis also used internal government channels to report misconduct. In fact, Tom Drake also reported his concerns to the Senate Intelligence Committee, the same one that Sterling went to, and they also became the targets of a federal criminal leak investigation for a news story by Jim Risen that they had nothing to do with. Making clear that punishing whistleblowers is a backdoor way of punishing journalists, the Justice Department used a subpeona 3 times on reporter Jim Risen to dangle a sword of Damacles over the heads of both Jim Risen and Jeffrey Sterling for nearly a decade and argued vociferously against any sort of legally protected reporter source privilege. In these attacks on the press too often the forgotten victims are unfortunately the whistleblowers like Sterling. I urge President Obama to grant him a pardon.